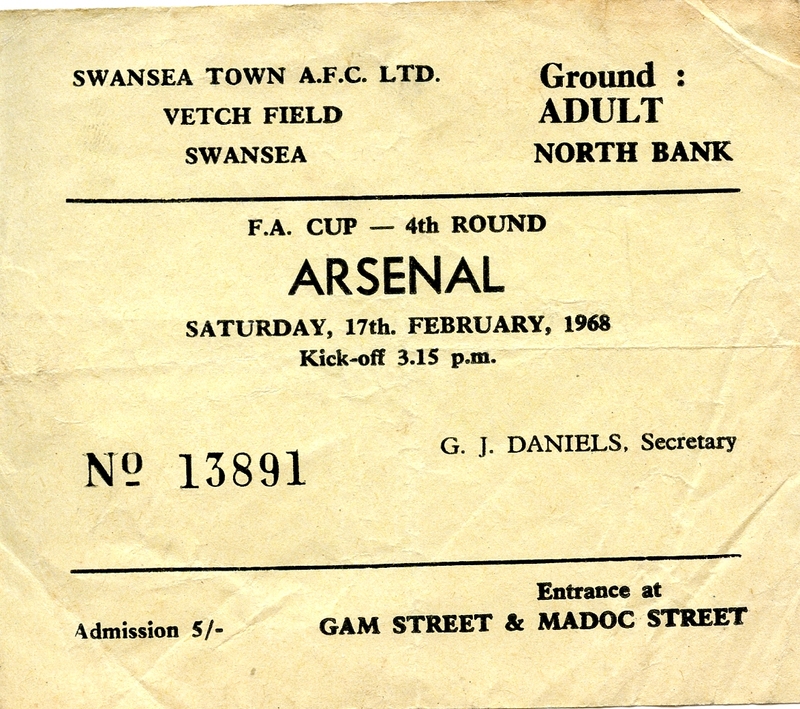 On Saturday 17 February 1968, Arsenal visited the Vetch Field to play Swansea Town in the Fourth round of the FA Cup. With Arsenal a First Division side, a cup upset was what the Fourth Division Swans aimed to achieve. The Vetch Field broke its record attendance, as 32,796 spectators squeezed in. Fans remember being squeezed into the ground ‘like sardines’. A header from Arsenal superstar Bobby Gould was to be the only goal of the game. Gould’s goal ended Swansea’s dream of a cup upset on a historic afternoon. Bert Mee, Arsenal’s manager, felt Swansea were ‘too good a footballing team to be lost in the obscurity of the Fourth Division’. Despite its legacy as a record-breaking afternoon, the game is notable for being perhaps the first time significant football-related violence occurred inside and outside the Vetch Field. Bobby Gould heads Arsenal to victory. Western Mail, 19 February 1968, p. 16. At the time of the match, football attendances were in long-term decline throughout Britain. The total attending Football League games had fallen from 41.2m for the 1948-9 season to 28.2m by 1971-2. Despite occasional seasons where the figure increased slightly, Swansea’s attendances were in decline. Average home attendance for league games had fallen from 22,535 in 1948-49 to 7,694 by 1965-66. Cardiff City faced a similar problem. Average league attendance at home games went from 35,091 in 1948-49 to 11,005 by 1965-66. Swansea’s average league attendance from 1921 to 2017. A breakdown of the numbers can be found here. The most significant reason for this decline was the rise of affluence among the working class. The 1950s saw an affluent society emerge as post-war austerity had ended. This was a decade of television, cars, DIY and better housing. Historian James Walvin, argues that technological and economic growth led to radical social changes. Disposable incomes rose giving people greater choice in their leisure time. Sitting at home watching television or taking the car for a spin were more appealing to standing on the terraces on cold afternoons, particularly for those with families and older generations. Family, too, was becoming more important in this better-off and some husbands were increasingly expected to spend time with their loved ones rather than disappear for an afternoon. With alternative leisure options came the altered demographic of spectators. Crowds grew younger which led to less supervision of its behaviour from older, calmer fans. Even when older generations attended, they often occupied the increased amount of seated accommodation, leaving the terraced ends to the younger generations. In line with the wider influences of the Teddy Boys and Mods and Rockers, a changing persona in the behaviour of the youth emerged. Affluence also benefited the lifestyle of young people. Between 1951 and 1963, juvenile weekly wages rose by 83 per cent. More disposable income meant young fans could travel to away games. Less supervision and travelling away gave an opportunity for trouble to occur. Historian Matthew Taylor believes football in this period, while still extremely popular, was falling out of favour with those who had once supported it. Swansea had gone from playing Division Two football for the 1964-65 season, to playing in Division Four by 1967-68. Despite this, the record attendance shows that football was still extremely popular, especially when the giants of Arsenal came to town. “Just like the old times to welcome so many of you to Vetch Field. We know that Arsenal have tempted many of you from your fireside, we think that some of you feel certain that cup football, rather than the bread and butter clashes in the Fourth Division provides the right sort of excitement, but whatever your beliefs – Croeso I Abertawe”. To put the record crowd into perspective, under 4,000 turned up less than a month later for a league game with Lincoln City. A new lowest attendance to date was then set against Hartlepool in the final game of the season. A mere 3,491 attended the game. The day of the game was expected to be a chaotic affair, but not due to the risk of violence. The match clashed with the Swansea University College rag procession, a charity fancy dress parade. E.G. Hill, the South Wales Transport traffic manager, stated that people should expect the complete disorganisation of public transport. Arsenal fans were flooding into Swansea from 8am onwards. Many came on special coaches at £1 per head, whilst others made the journey by car or train. Police and organisers were concerned that Swansea would grind to a standstill. Swansea University College’s charity ‘rag procession’. South Wales Evening Post, 19 February 1968, p. 1. Behind the scenes, some were concerned that the game would not happen. Ground staff arrived at the Vetch on the morning of the cup-tie to find someone had sawn through the goalposts at the east end of the ground. Quick improvisation meant the goalposts were reinforced with an angled iron wand. Match referee T.R. Walters and both managers were happy with the work. Precautionary measures had been taken with goalposts being sent over from Cardiff. Who was behind the vandalism still remains unsolved today and holds a place in Vetch Field legend. Club secretary Gordon Daniels claimed it was a stupid prank and obviously the work of students. David Rann, chair of the Swansea charities week, objected the allegations, stating how there was no evidence to support the claim. Groundsman Syd Tucker examining the severed Vetch Field goalposts. South Wales Evening Post, 19 February 1968, p. 1. The possibility of violence was not completely ruled out. By 1968, violence was emerging at football games. At the start of the 1967/68 season, Geoffrey Green wrote a column in The Times noting how hooliganism on the terraces had become a ‘universal problem’. Weary of the potential for violence, The Official Swans Supporters’ News section of the match day programme issued an appeal to notably young supporters. They were asked not to run onto the playing area during the match and requested not to throw rolls of paper onto the pitch. Inside the Vetch, it was apparent that a small but significant minority ignored the request to behave themselves. The game was stopped for two minutes whilst seven youths were led from the ground by police. Police helmets went flying when police went into the crowd to break up a fight between groups of youths. Youths dragged from the pitch before the start of the second half. Western Mail, 19 February 1968, p. 1. Away from the Vetch, violence occurred throughout the streets of Swansea. Inside Swansea market plums, tomatoes and peaches were grabbed from stalls and used as ammunition in a wave of vandalism. One young girl working in the market was injured during the violence. A nuisance was reported in the British Home Stores on Oxford Street. A group, thought to be Arsenal fans, attacked a number of programme sellers in the town. They made off with an estimated £20 worth of programmes. On reflection, Billy Lucas, Swansea manager, felt someone had to ‘crack down on this madness’. On the same weekend, football related violence occurred in other parts of Britain. A friendly between Newcastle United and Glasgow Celtic saw twenty-four fans arrested in and around St. James Park. A further seventy spectators were ejected from the ground. The Fourth Round FA fixture between Tottenham and Preston at White Hart Lane saw eighteen arrests made. Ticket stub from the Arsenal Game. For more, see the Swans100 collection on the People’s Collection of Wales. The emergence of football hooliganism in Swansea had a significant effect on the South Wales derby. Prior to the Arsenal cup-tie, no significant violence had occurred in meetings between Swansea and Cardiff. In the 1940s and 50s supporters of both teams watched in unsegregated zones. At worse, verbal exchanges in the form of ‘banter’, occurred between fans. United by their interest in South Walian football, no largescale violence occurred. It was not unusual for some fans to watch Swansea one weekend and Cardiff the next. A Division Two meeting at the Vetch between the two sides in March 1960 epitomised the friendly atmosphere. With Cardiff 3-0 up at half time, Swansea struck back in the second half to draw 3-3. Swansea player Barrie Jones commented how ‘both sets of fans clapped us off at the end… there was about four policemen in the corner of the ground and not a hint of trouble’. It was a different story when the two teams met in the two-legged Welsh cup final of 1969. The 3-1 Cardiff victory at the Vetch was overshadowed by violence. Supporters were asked not to throw missiles- an action that temporarily halted the game. On their return journey, Cardiff fans wrecked two train carriages. Windows were smashed and seats slashed. With the communications cord pulled ten times, the train arrived in Cardiff 50 minutes late. Part of the train carriage damage by Cardiff fans. Western Mail, 23 April 1969, p. 1. A representative from the railway summed up the changing atmosphere of the derby. Prior to this, the railway had praised Cardiff fans for good behaviour. The representative hoped the football related vandalism would not be ‘the start of vandalism on the scale experienced elsewhere’. The return leg at Ninian Park featured further violence. Police broke up scuffles between supporters in the popular bank section of the ground. Cardiff fans attacked two coaches transporting Swansea fans. With windows smashed and dented bodywork, the damage totalled £150. The once friendly atmosphere of the South Wales derby had evidently disappeared. The Swansea vs Arsenal FA cup-tie is remembered as the game which set the Vetch Field’s highest attendance. It is not remembered for being the first time significant football related violence occurred in the stadium and town. The violence was committed by a minority of young supporters, but witnessed by the majority of the record attendance. The violence and unrest that occurred was a product of the time. It was part of a trend that was emerging across football. Falling attendance opened the possibility for younger generation to become involved in trouble. The trend is evident through the transformation of behaviour in the South Wales Derby. Swans’ team: John, Roy Evans, Vic Gomersall, Herbie Williams, Brian Purcell, Davis, Humphries, Ivor Allchurch, Keith Todd, Screen, and B Evans. To view the match day progamme for the Arsenal game, click here. For a general history of football, see: Matthew Taylor, The Association Game: a History of British Football (Harlow: Pearson/Longman, 2008). A brief history of FA Cup, by David Barber, can be read by clicking here. More information on the history of football hooliganism can be found by reading: Steve Frodick & Peter Marsh, Football Hooliganism (Cullompton: Willan Publishing, 2005). Western Mail, 19 February 1968, p. 16. Matthew, Taylor, The Association Game: a History of British Football (Harlow: Pearson/Longman, 2008). Swans 100 Archive, Average League Attendances, available by clicking here. Brian Tabner, Through the Turnstiles (Harefield: Yore, 1992). James, Walvin, The People’s Game: A Social History of British Football (London: Allen Lane, 1975), p. 157. Richard Holt, Sport and the British: a Modern History (Oxford: Clarendon Press, 1993), p. 335. David, Farmer, Swansea City 1912-1982 (London: Pelham, 1982), p. 174. South Wales Evening Post, 17 February 1968, p. 1. The Times, 19 August 1967. Western Mail, 19 February 1968, p. 1. Neil Palmer, Derby Days: Cardiff City v Swansea City (Skipton: Vertical Editions, 2011), p. 32. South Wales Evening Post, 23 April 1969, p. 1.